Yesterday, we featured a female Purple Duke feeding on the ripened fruit of the Singapore Rhododendron (Melastoma malabathricum). Today's feature butterfly is yet another Purple Duke, but this time, it's a male , also feeding on the ripened fruit of the same plant. The species is common in Singapore, and at times, up to 6 or more individuals can be seen in a small patch of forest. Can you spot and compare the difference between the male and female of the species? The Purple Duke has a propensity of flying rapidly for short distances and then settling on the underside of a leaf with its wings folded upright when it is disturbed. This behaviour is quite consistent with the regular sightings of this species. 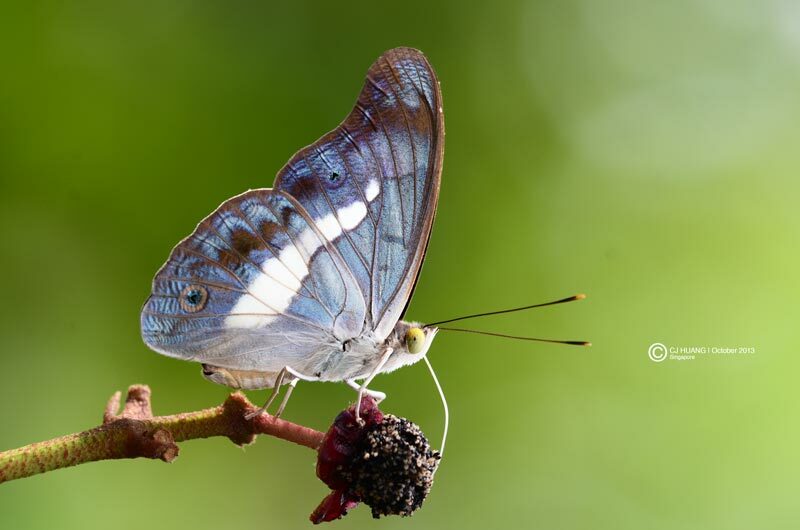 This shot was taken by ButterflyCircle member Huang CJ at the nature reserves last weekend.